No! Most people know (who use social media regularly) is: people do not represent the organization where they are posting; but they represent their own ideas (as wacky or as truthful as they may be). 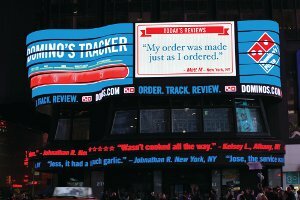 Dominos Pizza (who just reworked their recipes) decided to create a large billboard (125 ft wide) in Time Square to post what everyone is saying about them (through a live twitter feed). Wow. The exact opposite approach than a lot of churches who are afraid to have something posted on their page. They weren’t scared at all of what people were saying. Listening: It was a subtle way to say; we listen. Every post is interesting, engaging and informative. The Church is so used to “telling” and “preaching” that it’s gotten the perception that it’s not listening. Are you? How can someone tell you what they’re thinking? And how do you reward it? Transparent: A company or organization often has a secret “comments” box. Anonymously, people can comment on whatever they want. By Dominos having it totally “public”; it says that the organization is willing to be transparent with the world. Pastors often are concerned to not allow others to “share” openly, in case others may start having the same concerns. Wouldn’t it be better to deal with these things openly? What’s happened with the Dominos board? 80% of the comments are positive and 20% are mainly constructive criticism according to their spokesperson. Most of all it emphasizes their commitment to customer feedback. Wouldn’t that be a wise thing for the church to be known for? Something to think about.